Jersey Boys Broadway grossed $910,085 and had an attendance rate of 94.1%, about 4.6% more than that of the previous week. The 25 shows on the boards grossed $22,096,556, improving around 2.19% from the previous week’s totals. The broadway Fans Name Jarrod Spector Their Favorite Broadway Jersey Boy. Broadway.com asked readers to vote on which actor to have played a member of the Four Seasons is their favorite. The votes are in, and readers just can’t take their eyes off of Jarrod Spector, who landed in the top spot with 38%. 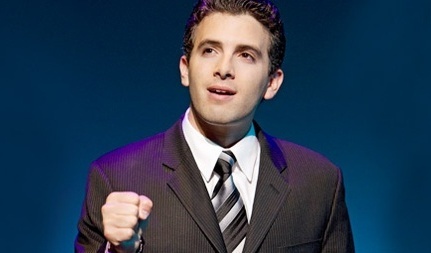 Spector first played Four Seasons frontman Frankie Valli in the Chicago production of Jersey Boys before taking over the role on Broadway in 2008. He is still wowing audiences nightly at the August Wilson Theatre. Following in second place is the show’s original Frankie Valli, John Lloyd Young. The actor, who won a Tony Award for his performance in 2006, earned 17% of votes. Third place went to another original cast member, J. Robert Spencer, with 12% of votes. Spencer played Nick Massi and later went on to score a Tony nomination for his performance as Dan Goodman in Next to Normal. Fourth place resulted in a tie between original cast member Christian Hoff, who also picked up a 2006 Tony Award for his portrayal of hot-headed Tommy DeVito, and recent cast member Sebastian Arcelus. Both actors earned 8% of votes. 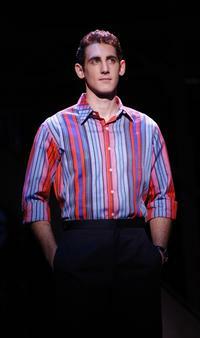 Arcelus first joined Jersey Boys in 2008 as the band’s singer/songwriter Bob Gaudio and returned in 2009. He departed the production earlier this fall and can now be seen as the title character in the new holiday musical Elf. Get your Jersey Boys Virginia/August Wilson Theatre Tickets now and meet your favorite cast. On Oct. 13, following the 8 PM performance, the Tony, Olivier and Grammy Award-winning musical Jersey Boys became the longest-running show in the history of Broadway’s August Wilson Theatre, having played 2,037 performances. 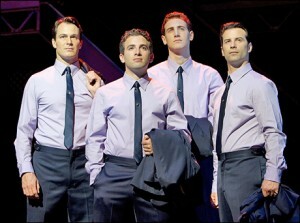 The current cast features Ryan Jesse (Bob Gaudio), Matt Bogart (Nick Massi), Dominic Nolfi (Tommy DeVito) and Jarrod Spector (Frankie Valli) as The Four Seasons; with Peter Gregus and Mark Lotito. The ensemble comprises Miles Aubrey, Erik Bates, Bridget Berger, Scott J. Campbell, Kris Coleman, Ken Dow, Russell Fischer, John Hickman, Katie O’Toole, Joe Payne, Jessica Rush, Dominic Scaglione Jr., Sara Schmidt, Taylor Sternberg. Jersey Boys is also currently playing in Las Vegas, London, Australia and in cities across the U.S. on a national tour. Buy your Jersey Boys August Wilson Theatre Tickets now! Jarod Spector, who plays Franki Valli, receives rave reviews for hitting the star’s legendary, high octaves. Audiences are blown away by his performance and ability to convey the persona of a passionate dreamer. Other members of the cast include; Matt Bogart as Nick Massi, Dominic Nolfi as Tommy DeVito, and Sebastian Arcelus as Bob Gaudio. With Des McAnuff as director, unbelievable choreography, and an amazing set, the play gives audiences everywhere a heart wrenching, behind the scenes portrayal of the Four Seasons. Fans can’t wait to see the hit Broadway musical live at the Murat Theatre, located at 502 North New Jersey Street in Indianapolis, IN. Save $10 off a purchase of $350 or more by using the promo code “AFF$10″. Check out all Jersey Boys Tour Dates and Cities .